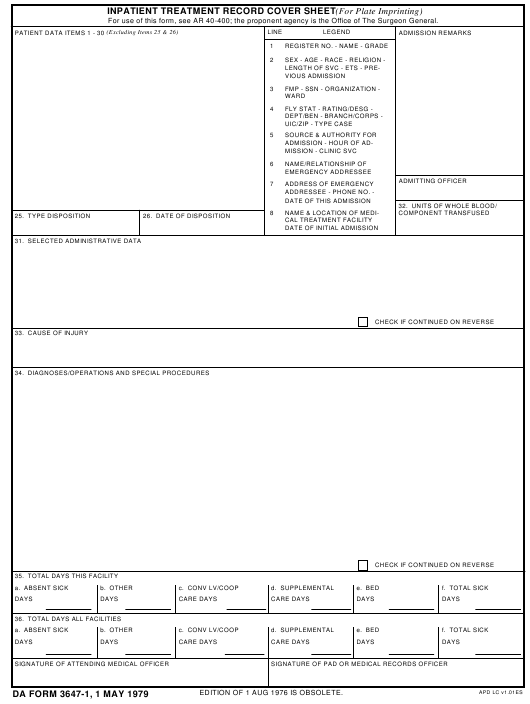 DA Form 3647-1 - also known as the "Inpatient Treatment Record Cover Sheet (for Plate Imprinting)" - is a United States Military form issued by the Department of the Army. The form - often mistakenly referred to as the DD form 3647-1 - was last revised on May 1, 1979. Download an up-to-date fillable PDF version of the DA 3647-1 down below or look it up on the Army Publishing Directorate website. EDITION OF 1 AUG 1976 IS OBSOLETE.